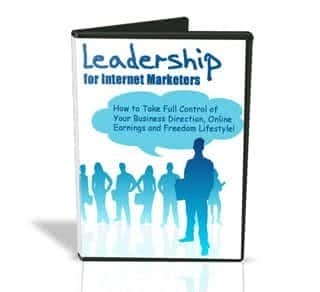 Learn how to take full control of your business direction, online earnings and freedom lifestyle with the leadership for internet marketers video. It was about time a course like this be made specially for the one-man Internet Entrepreneur though we sincerely think it should have been created way, way earlier. Today, we see a lot of guru worshipping with its fair share of guru bashing going on. Whether the top names of Internet Marketing are pulling off a big online event or having their credibility under the microscope, many small business owners are still not taking full control of their business and life! Leadership for Internet Marketers help break the ’employee mindset’ and motivates the one-man entrepreneur to take full account and responsibility for his own results in Internet Marketing. The single main problem that is preventing more than 99.9% of the Internet newbies from achieving the online success they desire – it all begins with the need to purge ‘this’ from their belief system. How to groom yourself to take over your business direction, financial status and design your freedom lifestyle without depending on your boss or even the Internet Marketing top guns! Time Management Skill – what constitutes productivity and what is a total waste of time? Maximize your 24 hours a day in the early stages of your business before you start enjoying working 4 hour work weeks! How to deal with skeptical family members, friends and relatives – this is reportedly one of the most common challenges a lone entrepreneur faces in the early stage of business when the idea of trying something new is met with extreme cynicism!